- But you have to watch your brothers so I don’t get eaten by them. Hey, they’re coming. This time, we are going to laugh, says Max. Pitounette’s two brothers are tired. They have been walking a long time in the woods and the gutters and desire just one thing: to sleep and to go to sleep very quickly. They settle down in their basket and nestle themselves on the dead leaves. When suddenly, ferocious caterwauling wakes up mother cat. -What’s going on? Why are you meowing so loudly? - Our bed is jabbing us – it’s not normal. And it hurts. We are tired and want to sleep but it’s scratching us. Then, Pitounette and Max look at each other, satisfied with their joke. -You have destroyed Max’s nest understand! Now it’s your turn and if you want to sleep in a warm bed, in a comfortable bed, well, make your bed again! Says Pitounette. Good night Max. See you tomorrow. The two brothers are obligated to remove the straw and after a while, they finally settle comfortably for a good night. On this night, the sky is black and full of bright stars. Pitounette moves closer to mother cat who understands and licks her daughter. Her two brothers will now stay quiet! 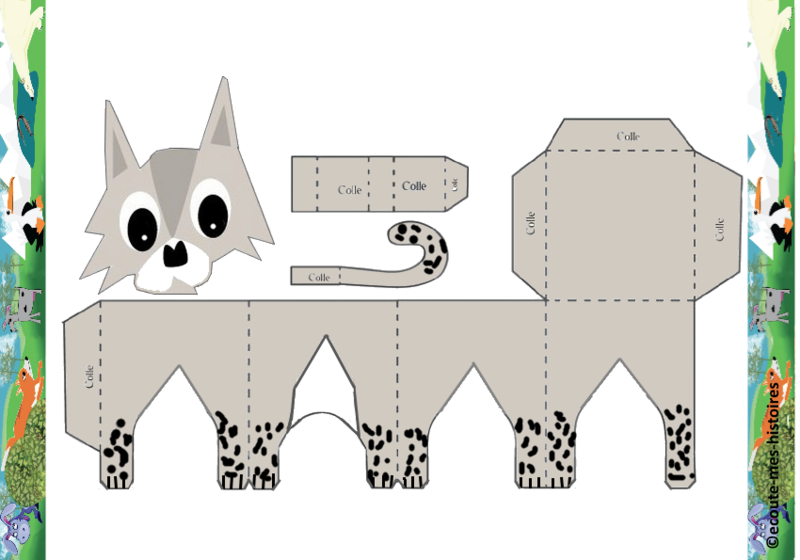 Educational activity: making a cat out of paper. Ask mum or dad to help you.